Today I want to thank four special bloggers who took the time to kindly recognize my blog by giving me an award. Melissa from Vintage Joy gave me the Let's Be Friends award. If you like books and flea markets and all kinds of cool antiques (and I did say books, right?) then Vintage Joy is a blog you don't want to miss. The wonderful J. Kaye of J. Kaye's Book Blog gave me the Heart of the Dragon award. Books, books, and more books and great guest posts are what you'll find on J. Kaye's blog. You've been there already, haven't you? The Lemonade award came from Unfinished Person at Just A (Reading) Fool. Check out UP's blog and find posts about books and the blogging experience. Don't be shy, read the opinion posts and then leave a comment with your response. 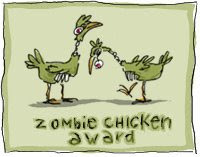 I got the Zombie Chicken award from Kristen at BookNAround. Kristin blogs about books and participates in several bookish memes. She reads a variety of genres, and I know there's a review or two or three that will interest you. Thanks so much for thinking of me, it really means a lot. In return, instead of passing along the awards, I want you, my readers, to take a moment to visit all four blogs. 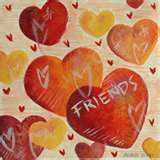 You might just find a new friend. It's never really a huge shocker when I see you awarded with these. You definitely deserve them! Congratulations on all the awards and the props to all the award givers. Congrats. I can only agree - you deserve any award coming your way. Congratulations! You and your blog deserve them all. Congratulations! Two of the bloggers who awarded you are new-to-me, so I'll head over and check them out. Congratulations. Well deserved. Heart of the Dragon is beautiful - love the colors. Congratulations on your well deserved awards! All well deserved - nice rewards for all your kind and hard work. Congrats on all your awards, Beth! They're all well-deserved! Congratulations! They are awesome awards and doesn't it always make you feel better and warm inside to get this kind of recognition? It never gets old, IMO.